This is a major upgrade with many of the features that have been on the wish-list for a long time. This new version is more powerful, but still easy to use. Common tasks, like rotating and selecting objects, or editing master page content have been made easier for new users. Experienced and professional users will appreciate the OpenType support, powerful print imposition options and enhanced PDF output. Many old bugs have been fixed, and performance has been improved. The spell-check dialogue has finally been fixed so that it does not move when checking a story. The implementation of OpenType features is particularly slick. For example, enabling Small Capitals, ligatures, or fractions in the Character formatting dialogue will use OpenType features automatically if those features exist in a font. If not, PagePlus will create Small Capitals by scaling capitals in the usual way, use ligatures if they exist in the font, and generate fractions using bold superscripts/subscripts. Times New Roman contains ligatures for fi and fl. Any fraction will be auto-generated, including fractions with text like 1/x. Commonly used OpenType features can be toggled on/off using an icon on the context toolbar, and formatting attributes have a new icon to replace the underline icon, which can toggle the last used character attribute on/off with one click. These formatting flyouts are both detachable as floating palettes. Insert automatic cross-references to other pages, headings, bookmarks, or footnotes, with or without a prefix, suffix, or hyperlink. Go to the target or edit the cross-reference easily. There is a lot to learn here, but more than enough options to satisfy most users. Create global or publication variables that can be inserted anywhere and updated throughout your documents without the need for find and replace operations. Great if you move house, or change your business contact details. Just edit your User Details and all of your templates will be updated to match. Formerly available only in WritePlus, Word Count is now accessible directly from PagePlus. It has been enhanced to count words in the current selection, and an option has been added to count hyphenated words as separate words or as one word. Mix Roman and Arabic page numbers in the same document. Start a new section at any point; restart page numbering or continue from the last page. The publication page number is displayed in the Page Manager, hintline, and Pages Tab. Documents may be either portrait or landscape as before, but pages of the opposite orientation may be used within the same publication. Add a spreadsheet or illustration in landscape mode within a portrait publication for easier editing. Facing pages are treated as one spread though, and you cannot mix orientations on the same spread. One of the biggest changes is to print preview. As before, this can simply be used to see how the publication will look on your chosen printer before committing it to print, but Print Preview includes many options for page imposition. A document that was set up as a standard A4 portrait document, can be imposed as a booklet, scaled up and tiled on multiple sheets, scaled down and printed as thumbnails, etc. Staple-fold booklets can be automatically adjusted to allow for page creep. Professionals do this with positive creep allowance on over-sized paper, but home users can use negative creep on standard paper to reduce the gutter for centre spreads so that the outside margins remain constant, avoiding the situation where text on centre spreads can get cropped if the paper is not perfectly aligned when it is stapled. The list of predefined autocorrect entries now matches OpenOffice Writer, and the tab key can be used to change paragraph indentation. PagePlus now uses low resolution proxy images for display at normal zoom levels. This saves memory and improves performance when working with high resolution images. However, if the user zooms in, the images are displayed at full resolution. Objects on the page are highlighted as the mouse cursor passes over them, making it easier to identify which object will be selected on clicking. Although this may be useful if there are dozens of small objects close together and overlapping, for normal publications with just one text frame on a page, it annoys more than it helps. Fortunately, a shortcut key can be assigned to toggle it on and off quickly. The full range of sold, gradient, and bitmap fills can now be applied to lines as well as to fills, expanding the creative options. The text wrap generator has been rewritten, resulting in more accurate wrap outline generation. This could sometimes affect text flow so check that it hasn’t changed when opening old publications. The changes are subtle, so in most cases text flow will be the same. This will please the professional users. Greyscale PDF output is much better, and output to FOGRA colour standards are now supported. PDF output can be scaled to produce different sized PDF files from the same PagePlus source file. The Layers tab now shows every object on the page, as in DrawPlus, allowing easier management of objects on layers, and rearrangement of an object’s z-order. By default, the layers tab shows the object tree collapsed, so this extra level of control is not obtrusive. It is an extra option for those who need it, but managing layers is just as it was before. Objects on master pages are now accessible from the normal page view. Either edit the object on the master page, or promote the master page object to the normal page. Modify the promoted object, e.g. to move a page number to bottom centre for the current page, without affecting the master page objects for all other pages that use it. Import settings from PagePlus X4 to get up and running quickly with the new version. Import: Gallery files, Keyboard shortcuts, Workspace profiles, Object styles, PDF profiles, Attributes (Option settings), Templates, Colour schemes, Palettes, Autocorrect entries, User dictionaries, Recent file list, Calendar Events and Table formats. Manage colour for two or more images with different embedded ICC profiles. Convert images to the RGB monitor profile for RGB images and the CMYK printer profile for CMYK images. This upgrade brings PagePlus up to the level of those over-priced professional page layout programs. There is something new for everyone though, not just for professionals users. Greater ease of use and numerous little tweaks and bug fixes have made the program faster to load, more responsive with large images, and generally more comfortable. Not all issues have been resolved, of course — short-sighted and colour-blind old folk still have to struggle to read the dialogues and HowTo help, and indexing long documents is still a pain, but as usual Serif™ offer an amazing product for the price of dinner for two. Edit your style sheets to check that everything is as you want it before you get to the final stages of your publication. Optical Justification is now enabled by default. Although this is right for body text, it is not suitable for Artistic Text and text in tables. Disable “Allow for Text Advances” in all paragraph text styles, especially body text styles. Remove the 10 point spacing after each paragraph, and use a first line indent instead. Then Tools, Save Defaults, and make sure that “Text Styles” is checked. Create a custom keyboard profile. Go to Tools, Options, User Interface, Shortcuts, and add a new profile. Modify any shortcuts you want for each program context, and save the profile for future use. Make a backup copy of the profile data, which is in %AppData%\Serif\PagePlus\15.0\Accelerators\ To save yourself some time, download my custom Keyboard Profile and copy it to your Accelerators folder, then select it in Options. The shortcuts are shown on the menus. Download my cheat sheet and edit it as you modify your shortcuts to keep track of any changes that you make. (This tip will also work for PPX4, though some of the commands are not available. It won’t work in PagePlus Essentials because the keyboard is not customisable). Customise the Studios to suit your needs. Set the Option, User Interface, UI Settings, Autoexpand On Full Bar. Customise the Toolbars. If you have a 5:4 or 4:3 aspect ratio monitor, try moving the toolbars from the left side to the top of the window. This gives quicker access to the Studios and reduces mouse movement. The same trick will work for PagePlus Essentials or PagePlus Statter Edition. Disclaimer: Edit the registry entirely at your own risk. There is space for a floating Studio tab on top of the menu bar. With large icons on my 1280x1024 monitor there is only enough space for two rows of toolbars, including the context toolbar. I have created a new toolbar called “Standard Plus” and reused a couple of flyouts from unused toolbars for Open and Save operations. If you add a new flyout from the customise dialogue, the buttons won’t work unless you open the flyout, that is why I reuse two existing flyouts. I have added one additional icon for Update Text Style, which I use frequently. Uninstall all of the fonts that you don’t use. PagePlus comes with a host of fonts, many of which are used by the design templates, but if you don’t use them, they just slow you down when selecting fonts. Get a font manager like MainType if you have a lot of fonts. The HowTo text is far too small for short-sighted people to read. Browse to %ProgramFiles%\Serif\PagePlus\X5\Tutorials\UK2057\ or \US1033\ and make a copy of default.css. Edit the style sheet to increase the font sizes from 8pt to 12pt or whatever you find comfortable. With the HowTo studio tab floating at the top on the menu bar as suggested earlier, the HowTo tab is plenty wide enough to accommodate larger fonts. Unlike the earlier PPSE 1.0, which was based on an older version, this is based on PagePlus X4, but with some key features like PhotoLab, Cutout Studio, PDF Import/Export, and Image Export removed. Nevertheless, it contains all of the latest improvements in areas where it matters most such as fine control of text justification and tracking, and some new features like Dynamic Guides and Custom Borders. It can open and save files from PagePlus X4 so it is very useful for sharing with colleagues who might be working on the same projects, but who don’t have the full version. Instead of sending them a PDF, you can send them the source file for editing, and ask them to download this free version of PagePlus. Although it is limited to creating documents of five pages or less, it can open and save longer documents, so it is a viable choice where team collaboration is the goal, without the cost of providing a full version for everyone. Don’t confuse this free version with PagePlus Essentials, which is designed for home users on a tight budget, but who don’t need professional output. This budget priced cut-down version of PagePlus X4 has all the features of PPX4 that home users will need, but at less than half the price. It is ideally suited to students, pensioners, or others on a low income. Although it lacks some of the more powerful features found in PPX3 at a similar price-point, it does have some of the best new features found only in PPX4 — PhotoLab, customisable picture frames and borders, dynamic guides, and improved text formatting. What is missing, that you will find in both PPX3 and PPX4, are some professional features. See the Feature Comparison Table for details. In brief, PagePlus Essentials (PPES) is the best choice for most home users. Choose PagePlus X4 for professional use. If your budget is tight, but do need professional output and/or PDF import, buy PagePlus X3. If you’re new to DTP and want to see what PagePlus can do, download the free version, PagePlus Starter Edition (PPSE). Use it as long as you like without any restrictions. You can create PDF files with CutePDF or similar. Unsupported graphic formats can be opened with IrfanView and pasted from the Windows clipboard. Versions prior to PagePlus X3 are no longer officially supported and have few advantages to justify recommending them so I have removed them from this review to make space for newer products. PagePlus X2 is about £10 on E-bay, PagePlus X3 is about £20 from Serif. The latest release of this Serif™ flagship product delivers further enhancements to an already very powerful DTP program. I am sure that it will be a popular upgrade. Long awaited and often requested is the ability to use inline frames and tables as well as graphics. Images, Tables, Text Frames, Artistic Text, or groups can be anchored relative to the page, page margins, frame, column, or character. Finer control over Tracking and Kerning, now in 0.1% increments. In previous versions the 1% increment gave only three or four usable values. To change manual kerning for artistic text, use the slider on the character tab. INITIAL WORDS — Format the initial words of a paragraph with Caps, Small Caps, Bold, a different font etc. Very useful in conjunction with Drop Capitals, or without them. The enter key now turns off numbered and bulleted lists if the last line is blank. The bucket tool can be used to join text frames and create new frames. Click on the overflow icon, then drag with the bucket tool to create a linked frame. Revamped default text styles palette to allow different default paragraph styles for different types of text object. Improved Table Quick Fill for European languages. Insert a zero width space to add optional line-breaks without the hyphen. Document Tabs — The new Publication Tabs toolbar can be shown automatically if more than one document is open, or left permanently shown or hidden. Tabs can be arranged in any order by dragging, and closed from a context-sensitive menu. The toolbar can be docked vertically on the side of the window, docked at the top or bottom, or left floating. The Text Styles Palette now includes a field to show any direct formatting that has been applied on top of the current paragraph style. Saving defaults has been made simpler. A dialogue with four checkboxes offers a choice of which defaults to save: document and object defaults, text styles, object styles, and Table/Calendar formats. The shortcut customisation dialogue now shows a warning if a shortcut is already used in another context. The snapping icon on the hintline has a popup menu to select from the most popular snapping options. Rotated Tables can be unrotated for easier editing by double-clicking just outside the resizing handles with the pointer tool . Double-click again after editing to reinstate the original rotation. Starting page numbers can be entered as Roman numerals or Alpha characters, not only as integers. Imported PDF documents have fewer text blocks and greater accuracy. Optimise for accuracy or for text flow. Crop to page area leaving registration marks on the pasteboard. Embed fonts to allow document editing if permitted. With improvements to the manual flowing of text between frames, PagePlus is now a viable choice for editing PDF files if the source document is no longer available. Easier alignment and positioning of objects using dynamic guides. Align objects to each other, to the page margin or page edges. This is a huge time-saver when laying out pages. Objects just snap into place where they are most likely to be needed. Nudge is also customisable to position objects more accurately. Alignment of objects to the inside, outside, or centre of strokes. Lines and borders can be inside, outside, or centred on the object’s fill. The screen shot shows a 0.5” square with a 50% transparent yellow fill, a 6 point cyan border behind the fill, mitred joins, and inner, centre, and outer stroke alignment. An image adjustment studio with Quick Artistic effects, adjustment filters, and special effects. This powerful new feature can almost replace PhotoPlus, though you will still need PhotoPlus if you want to import RAW images or for extensive retouching and painting of images. 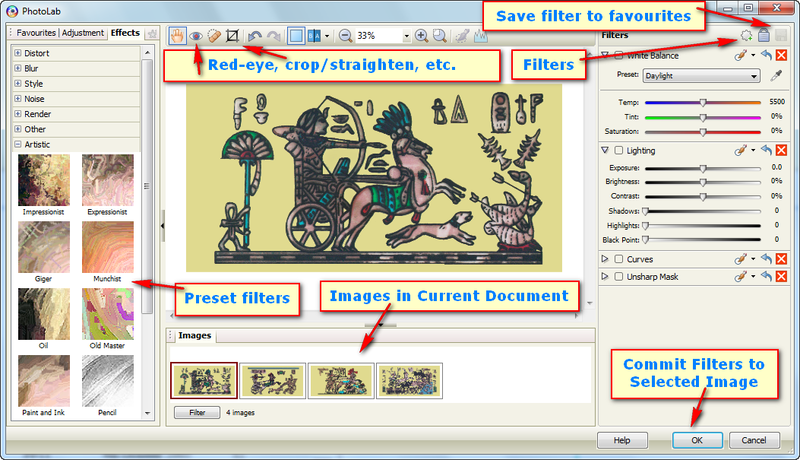 Filters are non-destructive — by default the original image is stored along with any changes made. This greatly increases the file size though, so you may prefer to disable the option in raster effects to save adjusted bitmaps. This will also speed up document loading. More versatile shapes can be created by combining or intersecting existing shapes, e.g. a quick arrow and a quick donut like this. Create custom borders from bitmaps. A wide selection of artistic picture frames is provided, but you can define your own, and they will be shown at the top of the list. The 1” border on the right was applied to a text frame on an A4 page. Mouse-over the image to see how it looks at 0.75”. The Picture Frames can be found in the Gallery studio tab. Just drag them onto the page and then insert a picture, or drag and drop them onto a picture to add the border to the picture. To add them to a text frame, table or Quick Shape, open the Line and Border dialogue from the Format menu, and select a border from the drop list. From this dialogue you can define the border’s width, the edges to apply it to, and whether to scale it with the object. To define a custom border, create a suitable graphic like the one below with patterns that will repeat on the sides and top, and corners that are used only once. Import the image into the line and border dialogue, and open the widths dialogue to define where the image will be split. Drag the lines to define the areas that will repeat and those that will not. If you want the centre to be drawn too, check the “Draw Centre” option on the border dialogue. I used an image of about 1800 x 1200 pixels @ 300 dpi, but 1200 x 800 pixels would probably have been good enough — 96 dpi was not. Table and Calendar Autoformat Editor — Create calendar and table formats to apply to any calendar or table. Define table header and footer rows, header and footer columns, and repeating rows/columns. Apply fonts, fills, transparency, and borders as part of the cell definition. This custom format for a Year Planner has a Header row for the year and title, another Header row (Caption) for the days of the week, a Header Column for the months, and footers for other details. The Weekdays and Saturdays/Sundays repeat, with different cell formatting, until the footer column. The month row repeats until the footer row. More flexible management of resources. The picture properties dialogue has been replaced. Instead the Resource Manager opens showing a thumbnail preview of the picture and details about it. Images can be exported or replaced from the resource manager. Linked files can be embedded, and embedded files can be made linked. To locate the file in the document, double-click the asset name or click on the locate button. Sort document assets by filename, size, etc., by clicking on the column headers. Import OpenOffice and Word Docx documents even without either program installed. Import most text formatting, footnotes, graphics, tables with formatting, index marks, and paragraph styles. All versions of PagePlus have so many features it would be impossible to list them all. Below is a list of the most significant features. Multilingual Spell-checking: Danish, Dutch, English UK/US/Canada, Finnish, French, German, German (pre-reform), Italian, Norwegian, Portuguese, Spanish, Swedish. Times are only approximate and are hardware dependent. Your results may vary. As monitor resolution increases, the 16x16 pixel icons that were designed for use on 800x600 monitors are becoming ridiculously small. Small fonts in dialogue boxes and HowTo help files make some features useless for older users. I don’t need to read the help, and I can guess what the icons do from their position on the toolbar, but new users do need to read help, and they are not yet familiar with the interface. Icon sets of 24x24 and 32x32 pixels are needed, larger font sizes need to be used by default, with an option to increase the font size too. The current 8 point Tahoma is way too small for anything other than a tooltip or hintline text, and page hints are even smaller. I would suggest 10 point for small, 12 point as the default, and 14 point for large text. See my tutorial on Customising PagePlus for a fix to increase icon sizes. The workspace (studio tabs) can be saved and recalled, and the recent documents list is now customisable between 0 and 16 files. However, the cursor position is not stored in the document. Rather than the nearly useless Open Saved Work file browser, which is just a bloated file open dialogue, what PagePlus needs is the ability to save the current work space with open documents including the cursor position, and the size and position of any tiled or cascaded windows. The Startup Wizard should include an option to resume from last time. It should also be possible to pin favourite files to the recent files list. See how neatly Jarte manages favourite files and folders. I would love to see this feature in PagePlus. PDF-XChange has something similar — pinning favourite files, resume from last time, and a button to clear the recent files list. Though I would not regard this as essential in a Page Layout program, allowing tables to extend beyond a single page would be useful. There are two problems with double lines: they are wider than their reported weight because the width is measured between the centre-lines of each line, and double table lines do not connect accurately at the corners. The current index is difficult to edit, and there is no concordance file option. Every index entry has to be marked individually. Ideally, the index entries would be fully editable within WritePlus when the option to show field codes is enabled. Find and Replace could then be used to edit multiple index entries in one simple operation. In CorelDraw it is very easy to skew objects by dragging selection handles. In PagePlus one can drag a corner handle with the Alter key held down or use the Rotate tool, but skewing is not an option. DrawPlus already has this. One can resize objects from the centre, but this only works if the object’s centre is snapped to a guideline. It would better if the guidelines were not needed. The Wintertree software currently used by Serif™ applications has several drawbacks. It would be better to make use of the excellent Hunspell checker, which already has dictionary support for many languages. Full support for Latin Extended character sets is required by many users — not only for users in Eastern Europe, but for anyone doing business with the Eastern Bloc countries. PDF Bookmarks also don’t support extended characters. I have added this tutorial section with tips and tricks to get the most out of PagePlus using some of its more advanced features. The program’s help menu includes a link to this web page where you can find both video and text tutorials on many of the program’s features. All of these tutorials are presented as PDF files and are produced using PagePlus X4. Most are also relevant to PagePlus X3, PagePlus Essentials, and some also to the free Starter Edition. Advanced Typography — How to use Optical Justification, Tracking, Kerning and Adaptive Letter Spacing to improve the appearance of printed text, and save paper. Custom Borders — Importing borders from PagePlus X3 or earlier and saving them for reuse in more recent versions. Creating and importing custom borders for PPX4 or PPX5. Using custom borders to create column rules. Customising Keyboard Shortcuts — This tutorial in in PagePlus X5 format as it contains tables that you can modify to record your own keyboard customisations. Formatting Footnotes — If you’re creating a document with lots of brief footnote references, each note takes a full line on the page, even if it is just a few words. This tutorial shows you how to format footnotes in columns at the bottom of the page. Grid Fitting — To ensure that lines of text on facing pages line up, the line-spacing of headings and body text need to be matched to fit an imaginary grid of horizontal guidelines. Headers, Footers, and Page Numbering — How to set up running headers, bottom centre page numbers on title pages, and define separate page numbering sections for long books. Looking Inside Documents — How to extract the contents of a PagePlus document to edit index entries more easily, or perhaps to fix a corrupted file. Optimising PDF Files — PagePlus includes several profiles for publishing to PDF, and you can create and save your own customised PDF profiles for later reuse. However, I found that I could get better results by compressing images before placing them, and not compressing them again on publishing to PDF. OpenType Features — An explanation of some common OpenType features, which are now supported in PagePlus X5. If the extra glyphs are mapped to a code -point they can be accessed from the Insert Symbol dialogue. You can find several free fonts with OpenType features on my fonts page. Working With Fractions — Using autocorrect to type the precomposed and stacking fractions found in some fonts. How to get the best looking results.